Curious where scooters do and don’t wind up in L.A.? Timothy Black, a former data analyst for the L.A. Department of Transportation, has created a live, interactive map showing the current location of available scooters and dockless bikes in the city. To build the map, Black used data the city requires scooter companies to make publicly accessible. While he says the map isn’t a complete snapshot of every dockless vehicle in L.A., Black was able to include location data from all scooter companies that have received conditional permits to operate in the city, which include Lime, Bird, Lyft, Wheels, Spin, and Uber-owned Jump. For anyone who spends time on the Westside, it won’t come as a surprise that Venice has by far the most scooters and bikes of any neighborhood, with around 2,100 devices available at a given time. Koreatown, Hollywood, Westwood, and downtown, meanwhile, each average around 700 to 1,000 vehicles. Black also created layouts for 26 other cities, which can also be viewed on the map, but most provide a more limited depiction of available scooters since the majority of local governments don’t require companies to make the location data accessible. Perhaps more interesting than where scooters are located is where they aren’t. According to the map, vehicles are all but absent in lower-income neighborhoods such as Boyle Heights, Sylmar, and Hyde Park. That’s despite existing incentives for scooter companies to deploy in low-income neighborhoods, which the L.A. City Council created when it approved rules for conditional permits last year. Each company is currently limited to 3,000 vehicles anywhere in the city but can operate an additional 2,500 in low-income areas. On top of that, companies can deploy up to 5,000 more scooters in low-income areas in the San Fernando Valley. According to Black’s map, however, Lime is the only company operating in the Valley, with around 200 devices. But that could be about to change. According to a recent press release, LADOT has issued one-year permits to allow a total of 22,500 scooters in the city. Of that amount, 14,000 must operate in “disadvantaged communities,” as defined by state guidelines. 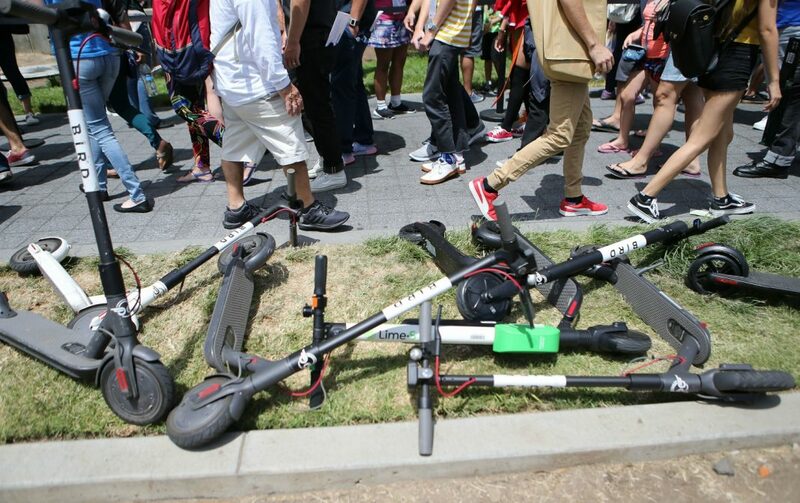 The companies that received the permits—Lime, Spin, and Bird—can began deploying the additional scooters starting April 15. Still, sizable portions of Hollywood, Koreatown, and downtown—which are already teeming with scooters—are designated as disadvantaged communities. That means it’s conceivable that companies could meet disadvantaged quotas by deploying in these already scooter-heavy areas, all while continuing to ignore many low-income neighborhoods. For more info on Black’s project, check out his accompanying post on Medium. RELATED: A Lot of People Are Getting Hurt on Scooters—so Who’s to Blame?